For reasons still not too clear to me, since I had a great relationship with my late dad, I never really wanted a son, and heaved a huge sigh of relief when Beng popped out a baby girl named Demi 44 years ago. Demi turned out to be everything we could wish for — bright, caring, and generous, an exemplar at her job in a major hotel in California, where she lives with her husband Jerry, another proud addition to our small family. We couldn’t have imagined that in our later 60s, Beng and I would have to learn grandparenting a boy — a two-year-old named Buboy, the son and second child of our faithful housekeeper Jenny and her husband Sonny, who have been living with us for many years in our campus home. Beng and I thought that everyone could work better if we kept the family together instead of stranding half of it in faraway Bicol. So Buboy was born here, and has known nothing but our large yard and the falling mangoes, treating our noisy guard dogs as his friends. Buboy wakes us up in the morning by banging his tiny fists on the door, and when no one opens it, he turns the knob himself and barges in with a ta-da smile. He likes to climb up our bed, which he thinks is his playground — and a trampoline. He eats breakfast with us every morning, dragging his high chair and clambering on board even before I get to sit. He loves rice and boiled egg, rice and boiled egg, rice and boiled egg. Beng taught him how to pray before meals — something I tend to mutter if not forget, but Buboy’s instruction forces me to do as he does and make the Sign of the Cross with exaggerated flourish, although Buboy seems to think that tapping just one shoulder will do as nicely. We speak to him in Filipino, just like we did with Demi — we’ve never believed in raising a kid in a foreign language, which school and society will take care of at some point — but he’s picked up a few favorite English words on his own: “no” (often used as in “Nononono!”), “fish” (“pish,” the Pinoy way), and “shoes” (which he can get picky about). He has his own plastic glass, and we make a toast and gulp our water down together, like drinking buddies. Breakfast is followed by half an hour of cartoons, but what he really wants is for Beng to open his favorite book — one about a forest whose creatures are endangered by bad people. I’m Tatay and Beng is Nanay. All dogs are Wowwow. All cats are Mingming. All cars and trucks are Peepeep (and he knows how to run back to his Mama when he hears a Peepeep rumbling down our street). When I’m away on a trip, he points to planes when they fly overhead, although I don’t know where or how he made the connection. A true tyke of his generation, he’s pretty good at figuring out how knobs and buttons work — twist this, press that. 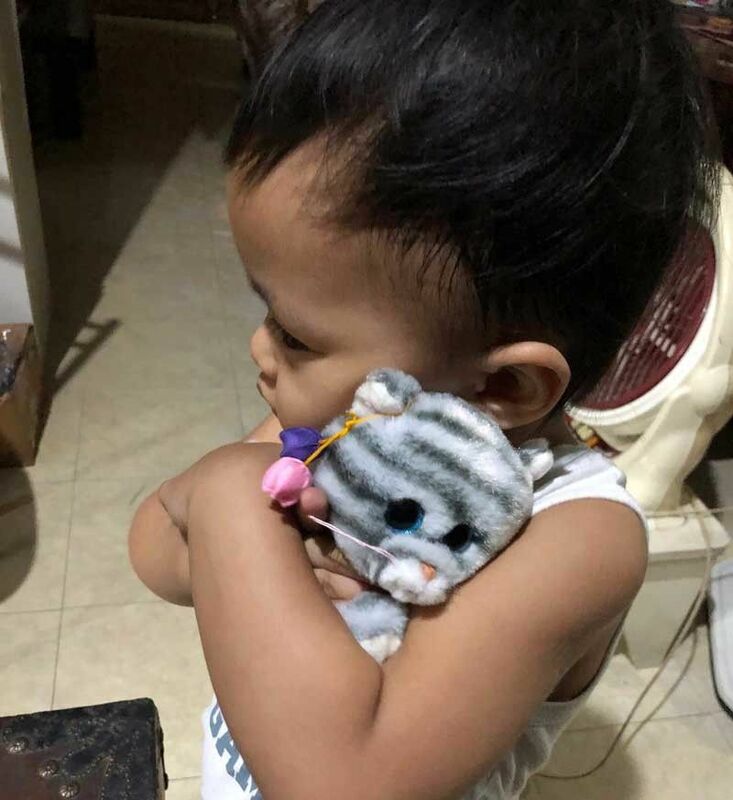 When our friend Julie visited recently from the States and had a few pesos left over, she bought a stuffed cat to give to Buboy, which he promptly adopted and called, of course, Mingming. It does take a village to raise a child, but it doesn’t take too much to make one happy.